Is something that makes me smile. Wouldn't it make you smile too? Even with the spotty window & mason jars! Love in every box full!! Uh huh........ fabric! From Heather Ross! I was sure to get Dream Bikes in both color ways, and the VW Buses in both colors. I also ordered the Goldfish, Gnomes and Mushrooms in all color ways available but alas...... we didn't get them..... yet! The one thing I'm learning very quickly and it just happens to be the main thing I'm not liking about "The Fabric Business" is the fact that you can order say 32 bolts of fabric and boom........ you only get 12 or 14 ........... most of the time you don't get the precious bolts that are most sought after. I'm guessing this is where I'm to be told that I need to roll with the punches or some crap about a crumbling cookie! I just wish they would tell you ahead of time what you are and what you aren't getting. I'm just saying. Last night while laying in bed........ wait...... Last night while being slowly pushed out of bed by a sleeping two year old....... I couldn't stop thinking.......... What if? 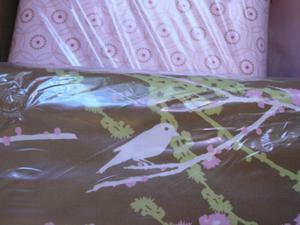 What if I didn't order enough of this awesome fabric? What if we sell this really well and can't get any more? What if I didn't order enough of this and that and this and that! My mind wouldn't stop racing about it. 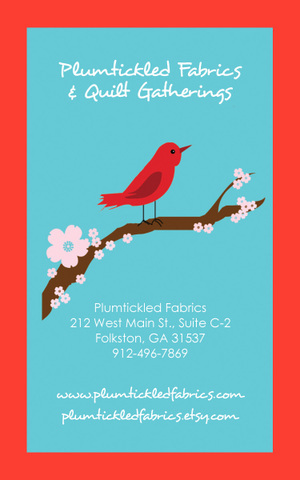 So, I woke up and faxed another order to Free Spirit or Westminister Fibers for another bolt of each of the Joel Dewberry fabric and four or six more bolts of Amy Butler...... AND, just in case I can't sell it...... I'll redo my entire house in it! LOVE IT PEOPLE! 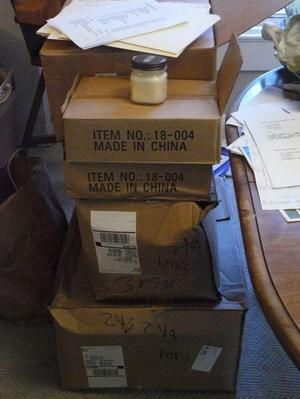 We also ordered some really great smelling candles that came in yesterday. You can see them on the box in the first photo above. We want to have a nice well rounded shop........ not just fabrics, patterns, notions and such but also gifty type of things. My Mom has had an antique business for years and has tons upon tons of vintage linens that she plans on starching, ironing and tying up in bows to be sold also. OOOOH....... almost forgot........ I ordered lots of good stuff from Sublime Stitching too! Love those! UMmmmm...... trying to think of other stuff. I've got lots of patterns on their way too. I was sure to order many apron patterns, bags and quilts too. 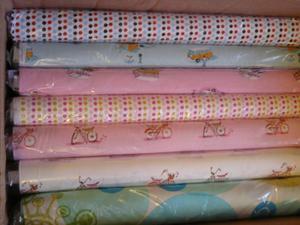 Not to mention several different of Amy Butlers patterns.......... mainly for me the Messenger bag and the Nappy Bag. I think they're wonderful and can't wait to make the samples. 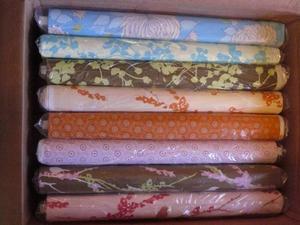 OH yeah, bad new to those who love and adore Urban Chiks Summer in the City Chicks fabric. It's no longer being made and they are completely out of stock. WTF!? Why in the world would Moda stop making that stinking...... 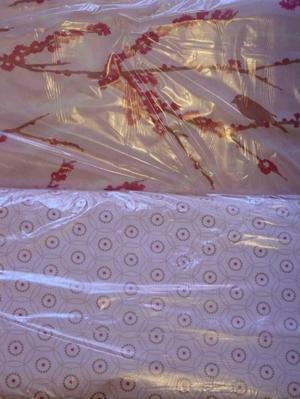 VERY POPULAR...... line of fabric? My mind can't grasp the thought. I just so happened to have ordered every single colorway of that line and guess what! I won't be getting any of the main fabrics. I'm ticked....... can't help but be ticked. I ordered more business cards and little extra somethings for our online orders. I'm gonna love 'em! I hope you guys are having a great day too! I'm sure I'll have more next week since my Angel of a Husband is working at our shop this weekend building our office, shelves and cutting table! It's finally time to start seeing everything put together that's been worked on since May! It's a good stay still!